internet, leaving a trail of “Stans” in its wake. 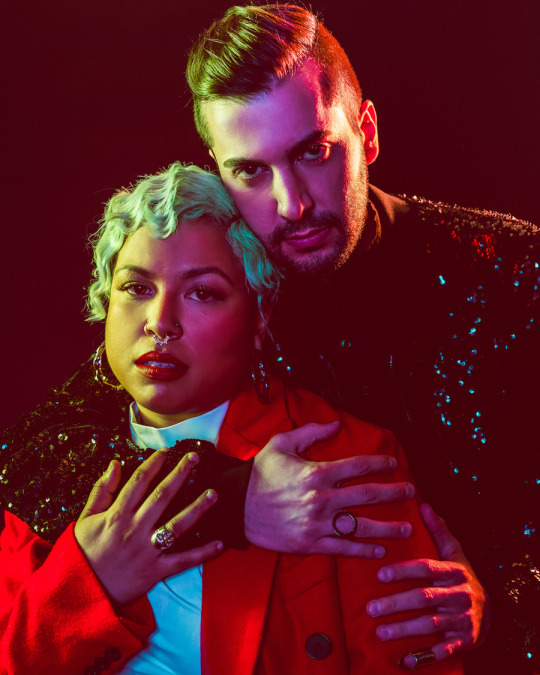 “Happy Sad” music is their game – Via’s voice a modern Sade and Na’el’s production full of throbbing synths and R&B. The vibe is one that could take you tumbling down a tunnel into Alice’s Wonderland – both a mystical adventure and a heartbreaking dream. Acid Rap mixtape in 2013. A friendship between the two quickly blossomed and their working style fell together with utter ease. In between their life in Chicago, the two seamlessly blended both of their musical interests and life experiences into one darkly optimistic genre. After carving out their niche, DRAMA returns with Lies After Love EP, a second round of happy sad tracks to further engross their fan club. The EP brings out a punchy confidence in the duo. As the lyrics once again resonate on relational intimacies, Nia Rosa doesn’t hesitate to cross uncomfortable boundaries. Dive into the EP for yourself as you read along to our exclusive Q&A with DRAMA, below. OTW: Can you explain the creativity process for the new EP? VIA: We love making music. A lot of the process is just off the flow of the day. We don’t schedule studio or writing sessions. We just kick it, discuss and then create when it feels right. There’s never any pressure to finish anything. So it gives us a lot of time to get it right. This project is really just bigger with lots of live instrumentation. Na’el really put his whole being into this production. We’re talking endless nights of producing, arranging and mixing. translates into the new EP? VIA: The “happy-sad” theme will most likely follow us forever. Gallows lyrically was about recognizing the sadness and acknowledging the need for healing and letting go. [Lies After Love] is more so recognizing the affirmations/lies we tell ourselves to get over heartbreak. The first single [was] “Majid,” which is about believing in “life after love.” It’s a conversation between lovers telling each other to still believe in magic despite their current situation. OTW: For those new to your music, what would you like them to know about you? ourselves. We really believe in universal ageless music and are always looking for ways to incorporate that into the lyrics and production. OTW: Outside of your own genre of music, what are some examples of artists or songs that inspire you? BOTH: Sade and Drake. Those are our faves. They’re in constant rotation all the time! Drake is the GOAT. Sade is the goddess of our lifetime. We also listen to a lot of world music like Boss Nova and Arabic music. One of our favorite songs 100% is “Tamly Maak” by Amr Diab. VIA: I’d describe my writing technique as a conversation with Jah/Allah/Grandfather/The Universe/God. Every song is like telling a true story. I try to remind myself of who I am and the things that I’ve experienced so that I can learn from my mistakes and avoid getting myself into the same situations again. It’s really just a journal put to music. OTW: What track are you most looking forward to performing from Lies After Love? BOTH: “I Choose You” we feel is our biggest song from [the] EP. It’s a summer jam that balances big vocals, expansive melodies, angelic vocals and heavy 808s. It’s meant to hit you right at your core. OTW: What lyrics from the EP resonate the most with you? VIA: It’s kinda my life story in a way. I’ve watched a lot of my exes move on to long-term relationships and even having kids. They fall in love so easily, which I find interesting. heartbreak of knowing that the person you once professed your love to will end up with someone else. BOTH: There’s this Australian group, Kilo on Ghostly Records that we really love. Drea Smith, the lead singer of PYYRAMIDS, is working on an amazing solo album right now. It’s gonna rock everyone’s world. Ravyn Lenae is totally amazing. Jean Deaux can out rap pretty much everyone.